Maybe if Mark Shields had taken the name of today’s Nice Price or Crack Pipe Ford Maverick to heart he’d still be running the show over at the Blue Oval. You could run this bit of the company’s history, if its price makes you feel like taking a chance. It turns out that yesterday’s 1983 Mercedes Benz 230CE was a cause worth fighting for, seeing as it inexplicably rocked a Cosworth 2.3 16V behind its traditional grille and three-pointed star. That was good enough for a decisive 63-percent Nice Price win to kick off the week. That’s awesome, and maybe someday we’ll learn the car’s sordid history. Who knows? Hey, are you a Maverick? You know, like Tom Cruise in Top Gun or John McCain before he became all talk and no walk? My favorite Maverick is the one once played by James Garner on TV. That’s because I like pretty much anything James Garner did. I’m also kind of liking this tri-tone 1976 Ford Maverick, if only because it rocks a semi-mohawk vinyl roof that gives the car its third hue. While named Maverick as part of Ford’s equine kick in the late ‘60s and early ‘70s, the compact two- and four-door compact was in fact, little more than a re-bodied Falcon, and initially shared that model’s drivetrains. This ’76 has a 250-cid “Thriftpower” inline OHV six which was the up-market six, and which was factory rated at—are you sitting down?—88-bhp. On the plus side, these engines will run practically forever. This particular one hasn’t run all that much, showing what the seller says is only a little over 46K on the clock. You might think that the odo has rolled at least once, but the car’s condition implies that the mileage—like Elvis Costello’s aim—is true. The body appears straight, and while it looks like it could use a good polish, and the bumpers exhibit a bit of surface rust, it seems pretty much to be a solid citizen. The paint is two shades of green, separated at the rub strip, with the vinyl roof bringing a third to the party. Oh, and that “pinstripe” down the side? That’s a bunch of tiny Ford emblems. They set off the flaming oval on the top of the windscreen nicely. Full wheel covers and whitewall tires additionally set off the old-school vibe nicely. The interior is likewise awash in green, only here it’s not just painted metal but the carpet, vinyl seats, and pinky finger-thin two spoke steering wheel getting in on the act. The front bench has suffered splits in the seat cushion, and I think that’s a can of starting fluid in the aftermarket hump console, but that could just be to ward off carjackers. The ad in fact states that the car “runs great” and has both a new power steering pump and a “carboulator.” There’s no mention of the condition of its doohickies or thingamabobs however. Amazingly, the engine bay looks complete, and there is A/C in case you’re worried those 88 ponies might overwhelm you. It’s truly getting more and more difficult to find these cars in unmolested form such as this. They have also reached an age, and a level of attrition, that rocking one as nice as this at a car meet would likely generate some crowding by the Ford faithful. The cost of that crowd? How about $3,500? That’s the asking for this lean, green machine, and it’s now your solemn duty to vote on whether or not that’s a fair deal. 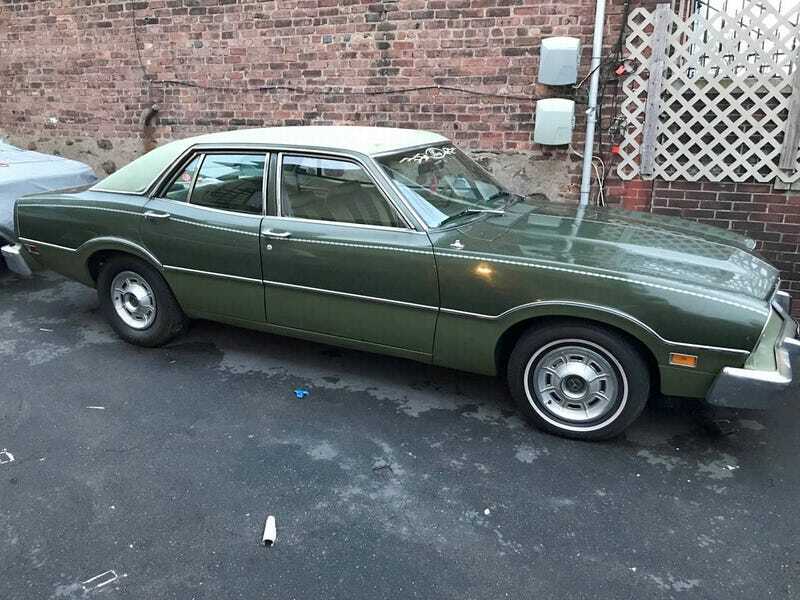 What do you say, does this old Ford sedan seem to warrant its $3,500 asking? Or, does that just feel far too conformist to you? Allentown, PA Craigslist, or go here if the ad disappears. H/T to KilgoreTrout53 for the hookup! For $7,995, Could You See Yourself In This 1983 Mercedes 230CE? Could This 1970.5 Ford Falcon bring $16,500?